Kaizen (改善) is the Japanese word for improvement. In business, kaizen refers to activities that continuously improve all functions and involve all employees from the CEO to the assembly line workers. It also applies to processes, such as purchasing and logistics, that cross organizational boundaries into the supply chain. It has been applied in healthcare, psychotherapy, life-coaching, government, and banking. Time to read: 12 minutes (based on 150 words per minute). My total daily commute is anywhere between 1h 30m and 4h+ in the event of an extreme snow storm. I am driving in the morning and my wife is usually driving in the afternoon. Like with any commute, the sooner we get to the office, the better. This is why I try to find the best possible route from home to work. One of my goals each day is to squeeze a few extra seconds (or even a minute) here and there. For example, there is a sequence of two traffic lights. One is to turn left and the other is to cross a crosswalk. I noticed, that if I am the first car when turning left, then I almost always catch the red light on the next one. Also, if I am the last car when turning left, after I wait for the opposite traffic, I also catch the red light on the next one. So, each day I pick up my research and improvement initiative from where I left off, and try to change my usual driving speed in order to avoid the red light on the next traffic light. I am also assuming that both lights are timed and that it is possible to game the system. I also try experimenting a lot. In the beginning, while getting used to the traffic, I would just follow the GPS. It was Summer, the traffic was low. It did not matter which way you would go. Later in the year, I started noticing some traffic jam windows. We could not change the time we were leaving, so I started experimenting with different routes. It took me weeks and maybe even months to map a better route with less traffic. Then, winter came. I had to start experimenting again. Sometimes it works, sometimes the results are horrible. There are three main streets going into our direction. The traffic on each of them depends on the season and the day of the week, but also on the time. Once, on a Sunday, one of my experiments lead to a net increase in 2 hours to get downtown. A while further than these two traffic lights, there is a bump on the road. I have no idea why it has not been fixed by now, but it does not matter. The right approach there, is to look for cars in the right lane, and if it is free, keep as right as possible in your lane almost stepping onto the line separating the lanes. This allows you to take a lighter bump than if you stay in the middle of your lane. Needless to say, it took me months in frustrating attempts to improve that part of the commute. Obviously, you have to accept failure as an option (and often as a reality) if you want to improve anything. Also, occasionally you can get lucky and think that you have found an improvement, only to be terribly wrong on the next day, and the whole week. In this case, Kaizen means to take a step back, rethink what you have been doing before, and resume the learning from the last safe spot. If you keep doing what you’ve always done, you’ll keep getting what you’ve always got. In case it was not clear so far, I am actually having fun at this. My wife makes fun of me, but I usually scream “Kaizen!” when I find a better way to do something. And it is even worse for her, because she speaks Japanese and I usually say the word wrong. The MacMillan Dictionary says [kaɪˈzen], but that is not good enough for my wife. 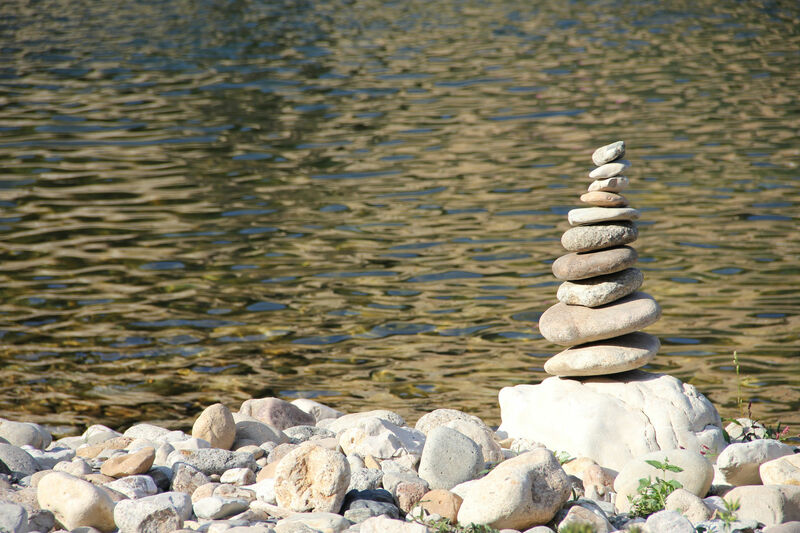 Once you’ve started using Kaizen in your personal life, you can easily start practicing it in your professional life. I read the book First Things First by Stephen R. Covey a while ago and started practicing his system. You can find more information about it in another of my articles. It teaches you to make sure that your main thing (a.k.a. goal) is the main thing on your agenda. It urges you to evaluate your goals and your time management processes. In order to make room for my first things practice I started experimenting. I know that I am more active in the morning and I have more energy before noon, so I started prioritizing my most important things in the morning. I started swapping them around. And finally, I found the way it makes the most sense to me. Also, I internalized the habit of doing these first things first. We all have four windows of awareness: known to us and others; known to us but not to others; known to others but not to us; unknown to us and others. You cannot uncover the third one (the blind spot) without the help of others (family, friends, peers at work, reports, and managers). So, ask for feedback, be prepared and willing to take it (good and/or bad), and, most importantly, act on it. Expect failure along the way, but take the required measures. For example, part of my job is to create reports. I never consider my report toolkit as complete. There is always something to improve. There is always something to remove. So, I accepted feedback and I asked for feedback. It changed when stakeholders changed and I updated my tools again. If you are interested in reading my article on how to write better reports, click here. As part of my job, I have to manage the roadmap of whole domains, usually spanning more than 1 team (up 5 so far). As I transitioned between domains, I obviously took my toolkit with me. But I always had to adapt it to the new domain, the new business partners with whom I had to work, their own preferences and peculiarities. For example, one of my partner managers was more concentrated on the vision and people management. In this case, I was concentrated on details, even micromanaging month by month. Another partner manager was stronger micro-manager and very detail oriented. I concentrated on the vision and the high-level picture. As I already said above, you cannot afford to be inflexible. Your environment is constantly changing and you have to adapt to it. Finally, I say “no” a lot. Not only to people, tasks, and temptations, but also to my own needs and urges. For example, I am detail freak. I cannot find peace until my spreadsheets are not perfectly formatted and all formulas have a “if <cell> <>””, <cell>,”” clause. This is why I forced myself to use the time-box habit. When I have a task at hand, I give it 1 hour. If I am not done by the end of the hour, then I leave it for the day and pick it up on the next day. Surely, this requires a lot of planning and making sure that I work on that task in advance (sometimes weeks ahead), so that I can afford to leave it for a day or two. Saying “no” also means having the courage to review and unlearn some of the old habits. A leftover from my engineering days was that I believed in waiting till the last few days and spending 10+ hours to finish the job on time. Unlearning this habit made my productivity spike. 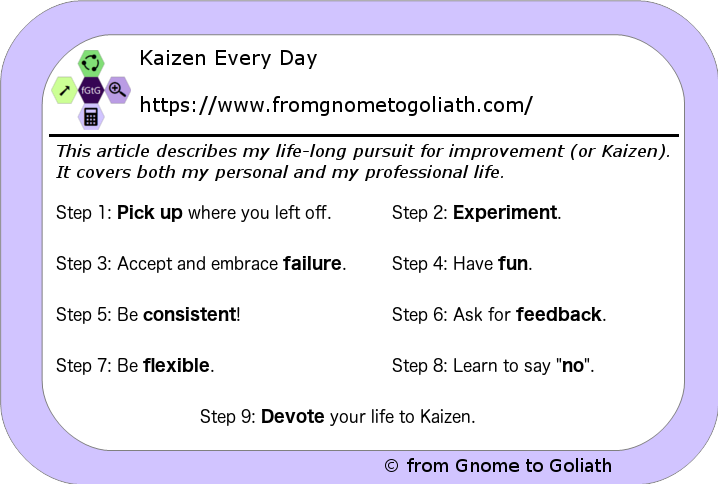 I strive to be Kaizen in everything that I do – from my personal life (e.g. commuting) all the way to my professional life (reports, task management, time management). And I am having fun doing it, it gives me energy, and it makes me wait and long for the upcoming day, when I can find even more amazing ways to do something better. Or not, failure is always there to teach me. Now, this may sound too much. But Kaizen is a lifetime pursuit. I believe that we owe it to ourselves to always keep improving. There will always be something that needs improvement. Circumstances will always change, urging us to improve in other directions. I invented the concept of frustration free mornings. This is a process for gradually finding the best set of events to set myself and the whole family on a frustration-free path. I studied my own habits carefully, but also the habits of my wife and kid in the morning. And I experimented a lot over years to find the best way to start the day. When I found it, something changes (e.g. my kid was old enough to sleep without diapers), so I started exploring again. It never ends. If you want to learn more about frustration free morning, go to this article.